‘“I’ve never met a morph that I didn’t like,” I say, repeating a joke I heard a long time ago in an episode of the TV-series Fame. My wife has just asked me to explain what metamorphic rocks really are. 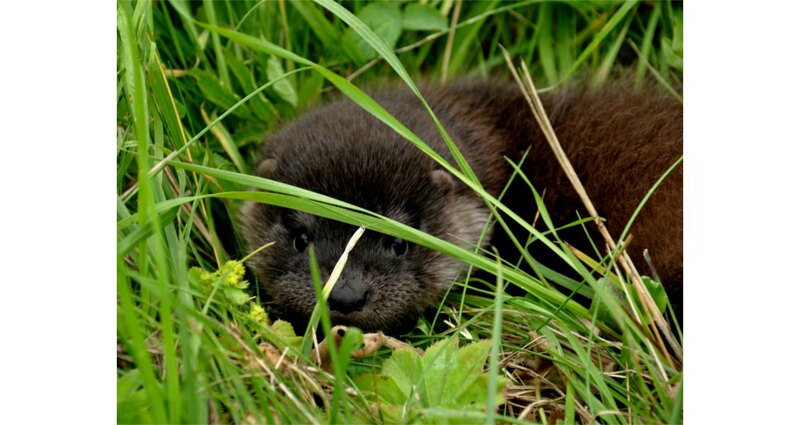 I continue: “One of the students was asked to… Oh, never mind!” We are at the Norwegian coastal village of Bud – a paradise for those who love nature and fishing. 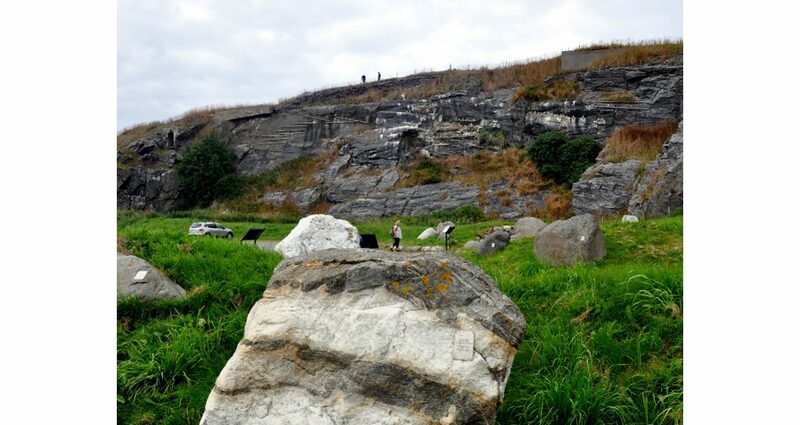 We have parked in a former quarry and in front of us is a naturally-occurring exhibition of different rocks found in the region, mostly various metamorphic ones like gneiss and marble, but also granites and conglomerates. The Atlantic Road on the north-western coast of Norway runs from Vevang on the mainland up to Kårvåg on Averøy Island. 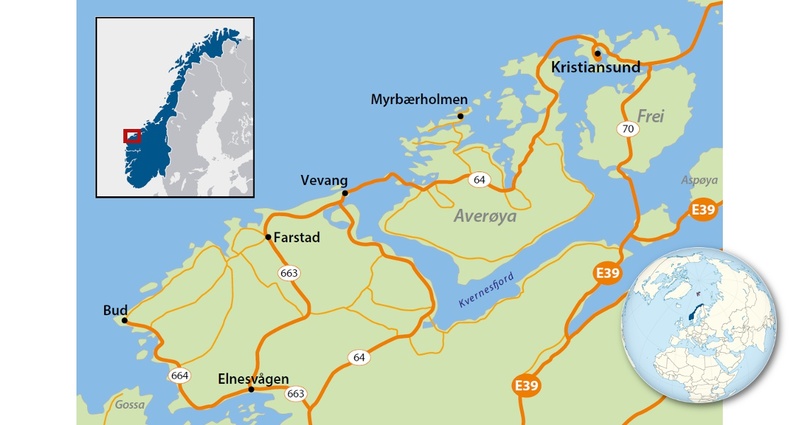 To get to Bud from the city of Kristansund, one must drive along the Atlantic Road, often called the ‘road in the ocean’, which runs north-westwards from Vevang on the mainland across to Kårvåg on the island of Averøy. It is only 8 km long, yet passes across 17 islets and skerries, with over 10% of its length on bridges. In 2012 it was officially named one of Norway’s 18 ‘National Tourist Roads’; it has received a number of other awards – and, according to Lonely Planet travel guide (2007), the Atlantic Road is the world’s best place to mend a broken heart. No wonder it has become one of Norway’s biggest tourist attractions! Bud is certainly a good start for a road running through some of the most scenic landscapes in Norway. From the disused quarry you can walk up to the Ergan coastal fort, a war museum built around the WWII German coastal fort, as well as the natural and cultural exhibition in modern buildings next to it. The steep quarry wall holds a colony of breeding kittywakes. From the top of the hill the panoramic view is stunning: the wide North Atlantic lies in front of you, numerous islands and the strandflat open towards the south-west and the north-east, with the gentle mountains rising behind you. 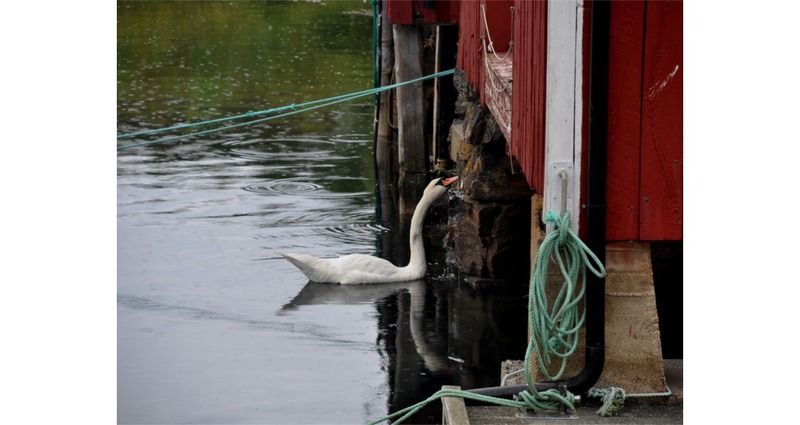 On our walk towards a local fish restaurant we meet a cute little fellow in the middle of the road – a young sea-otter – while in the harbour in front of us, we discover a majestic swan sipping rainwater dripping from an old quayside warehouse. Yes, we believe this place could mend a troubled heart, at any time. The Lonely Planet claims it is best to go there in the autumn, when the combination of the view, the wind, waves and the cries of the gulls are at their most intense. During the construction of the Atlantic Road the workers experienced 12 hurricanes before it was finally opened in 1989. The Atlantic Road runs along the north-west corner of what is called the Western Gneiss Region on the geological maps of Norway. The Precambrian rocks of this region cover an area of more than 25,000 km² west of the Caledonian nappes from Sogn to Nord-Trøndelag. 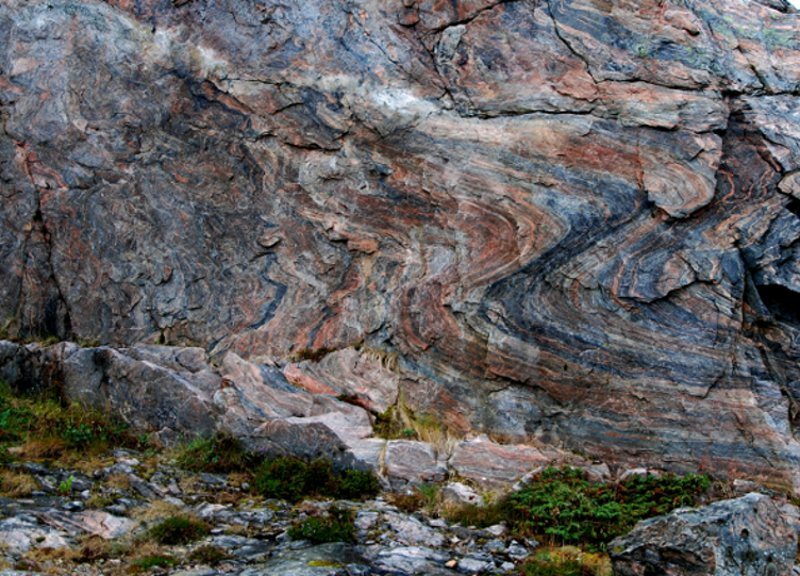 During the Caledonian plate collision around 400 million years ago, these rocks along the western margin of the Fennoscandian Shield were conveyed down to a great depth, heated, metamorphosed and deformed. Folded Precambrian gneiss at Ramsøya. (Photo: Morten Smelror) At the end of the collision the Caledonian mountains stretched from Scotland to Svalbard, as high as today’s Himalaya, before being eroded down to their roots. Over the past 2.6 million years repeated glaciations and coastal erosion have sculptured the landscape along the Atlantic Road and left us with scenic exposures of metamorphic rocks, dominantly granitic gneisses and migmatites. 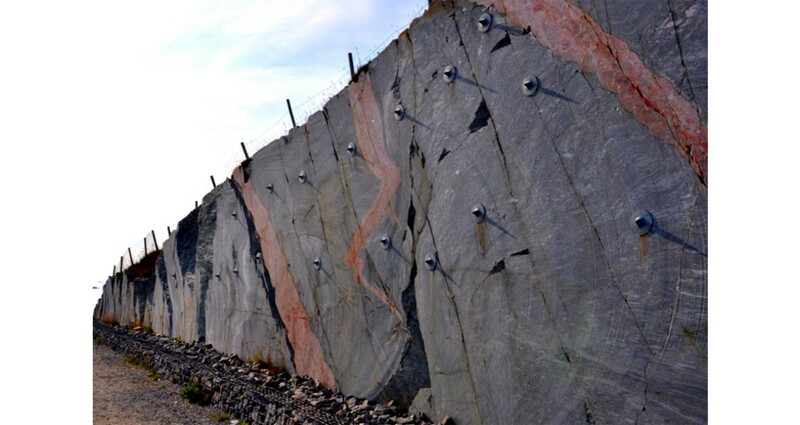 While most of the rocks in the Western Gneiss Region were formed between 1,700 and 1,500 Ma, some of the bedrock found in the region along the Atlantic Road is around 1,830–1,840 million years old, and thus a continuation of the Trans-Scandinavian Igneous Belt in Sweden. 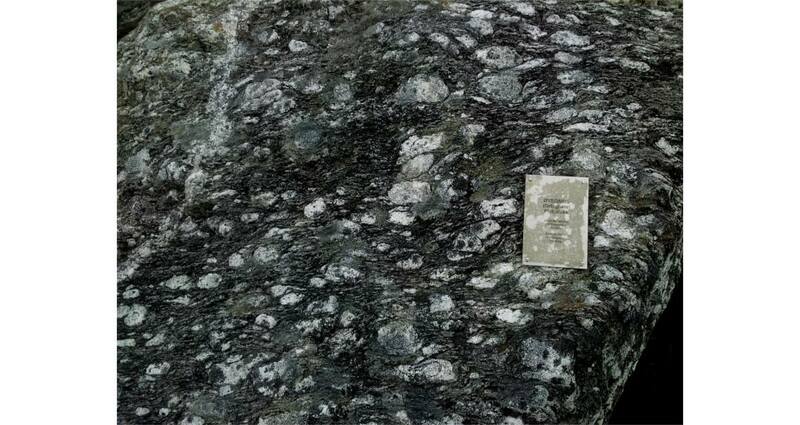 Gabbroid gneiss, granitic gneiss, migmatic gneiss and granite were formed from 1,686 to 1,653 Ma, and somewhat younger crust (1,650–1,630 Ma) was also formed in the southernmost part of the Western Gneiss Region. We leave Bud and drive a few kilometres north to Hustadvika. 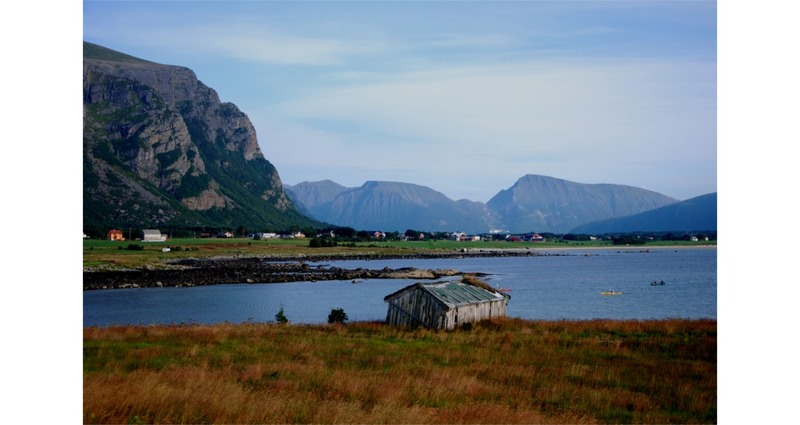 Given that the open water to our west is one of the roughest and most feared ocean stretches along the Norwegian coast, the green fields around us and the long sandy beach in the bay appear surprisingly calm and pleasant. Another surprise is the presence of plutonic rocks that almost entirely escaped the Caledonian orogeny. Near the lighthouse at Farstad the rocks of the Hustad Complex (1,654 Ma) consist of reddish granite surrounded by monzodiorite and some pyroxenite. Here, samples of the basement deep below the present surface have been brought up and laid before us as an intrusion breccia. These samples, or xenoliths, consist of dark rock types that seem to have been formed by early differentiation from the magma itself, together with light-coloured dioritic rocks. The view is magnificent, and great bedrock exposures are numerous, as we continue northwards along the Atlantic Road. The wave-washed surfaces make it easy to see the various geological structures. If you get tired of studying the landscape and the geology, you can take side-tracks to the historic fishing villages, or you can enjoy fishing from one of the many islets and bridges along the way – not to mention the unique possibilities for scuba-diving in the shallow oceanic water just offshore. If you turn inland, great places for mountain hiking are easily found. And if you want more geology, the road builders have made it easy for you by creating a great clearcut bedrock exposure at Myrbærholmen. Here you can study the rocks in detail, and discover younger dykes intruding into the gneisses. Few places offers such good possibilities for ‘polished plate’ examinations of the geological structures. The landforms of present-day Norway were largely shaped by glaciers in the last 2.6 million years. Along the Atlantic Road you travel on the strandflat, a low brim to the mainland, headlands, islands and skerries. 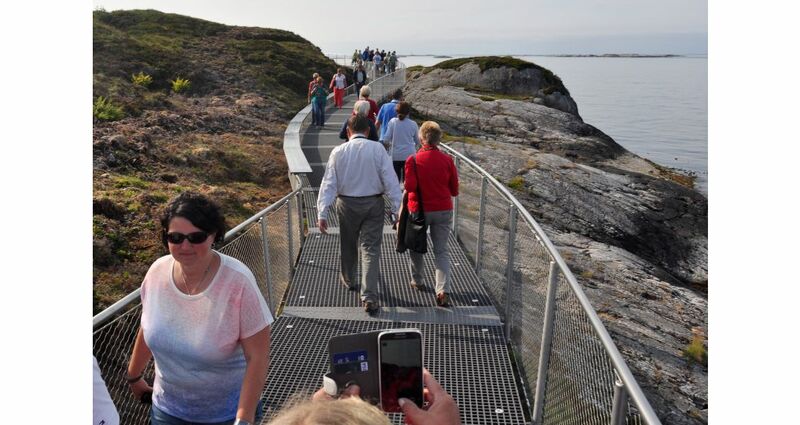 On Averøy, at the northern end of the Atlantic Road, a modern and somewhat architecturally futuristic visitor and information centre was opened in June 2014, along with a trail and walkway around the small island, which offers a safe walk and a great panoramic view of the surrounding strandflat. The formation of the strandflat has been the subject of much debate. Many researchers believe that the coast was free of ice for long intervals during glaciations, similar to conditions along the margins of Svalbard and Greenland today. Weathered bedrock was removed from the foreshore, first by waves and later by glaciers. As a result the coastal islands developed a low-lying bedrock topography, with a well-defined inner margin bounded by steep mountainsides. Since weathering was most intense close to the sea, the steep mountain margin was maintained during colder periods. 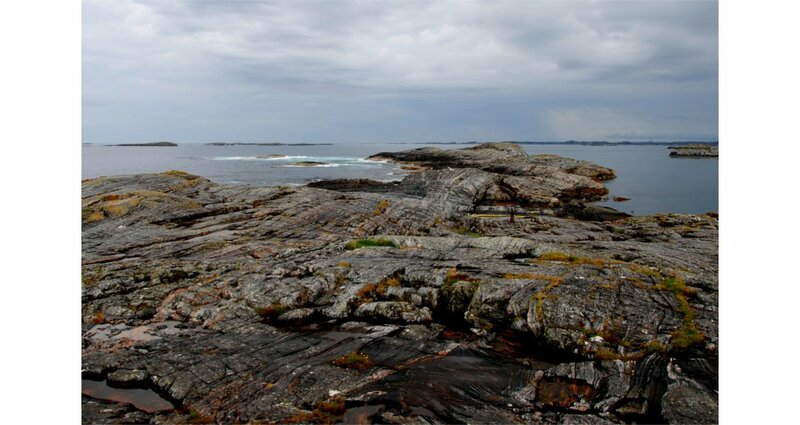 In a recent study, researchers from the Geological Survey of Norway suggest that during Mesozoic times there was deep weathering of the bedrock, laying down the foundation for the formation of the strandflat and fjords, which in a tropical climate lasting for millions of years made the bedrock porous, and the rocks became less resistant to later erosion by waves and ice. Some rock formations were more easily weathered than others, and while meta-sedimentary rocks and especially shales were eroded, more solid granites, gneisses and gabbros were left behind to form islands and skerries, as well as in some places small steep mountains extending up from the strandflat. Today, we can find occasional isolated zones and small pockets of loose, weathered bedrock, but generally the results of deep weathering are hidden to the naked eye. 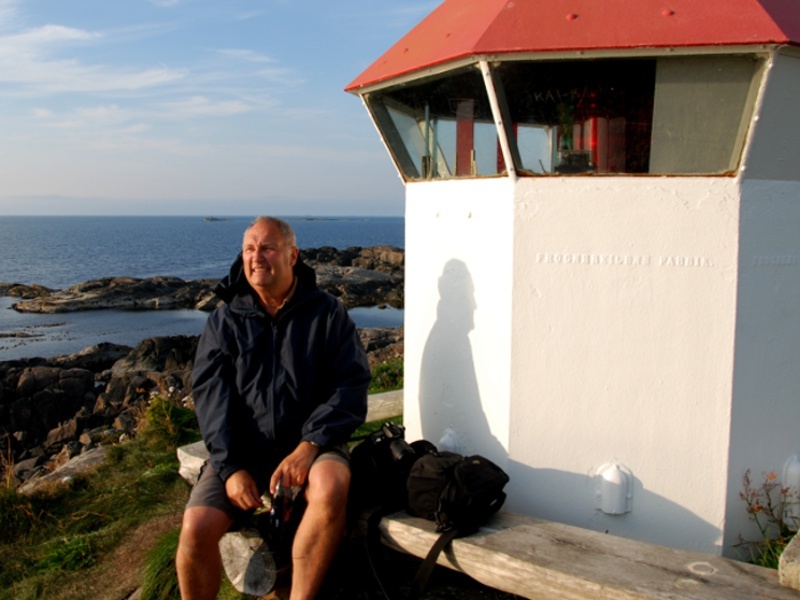 The author enjoying the view of the ocean and strandflat at Farstad lighthouse. (Photo: Berit Løkken) On your way along the Atlantic Road you should find time to enjoy some of the local culinary treats. The cheese Kraftkar from Tingvoldost won the award for the best blue cheese at the International Cheese Awards in 2013, and fresh fish of various kinds from the Atlantic Ocean is of course a must. However, the best known speciality from the district is bacalao: dried, salted cod, known locally as ‘klippfisk’. The production of bacalao dates back to the 1600s and became very popular in the 1700s. Both in former times and today most of the production is exported to an international market. The town of Kristiansund is founded on bacalao production, and even today is known as the Bacalao Town. Naturally, it has its bacalao museum, a bacalao festival and a bacalao opera. After a geotouristic journey along the Atlantic Road and studies of the geology of the ‘klippfisk’ hills, nothing could be more natural than ending the day with a meal of bacalao. With mountains, springs and ancient civilisations , Cappadocia is one of Turkey's most fascinating areas for tourists, historians, archaeologists and geologists alike.